The Eastern Mennonite University Summer Peacebuilding Institute (SPI) instructor behind a restorative justice pilot program for Richmond Public Schools (RPS) has led an “epic” life, says a July 2018 Richmond Magazine article. Read ‘A Guru for RPS? about Ram Bhagat. In those two roles – of truth seeker and truth teller – Bhagat has brought a collaborative spirit to EMU. 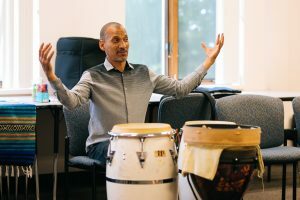 He’s enrolled in the restorative justice in education graduate certificate program, but also has been an influential contributor to several of the university’s programs, bringing a unique synthesis of restorative justice, education, mindfulness and yoga practice, and racial trauma healing. Bhagat co-taught Strategies for Trauma Awareness and Resilience (STAR) I during SPI this summer. Now the retired science teacher is developing a program to promote restorative education and intra-racial healing in Richmond Public Schools. The two-year initiative is funded by the W.K. Kellogg Foundation’s Truth, Racial Healing & Transformation Initiative through Initiatives of Change/Hope in the Cities. In the early 1990s Ram Bhagat co-founded Drums No Guns, which uses rhythm to build healing community. Called “Massive Resilience” – a recoining of the phrase used for the anti-integration “Massive Resistance” laws enacted in Virginia in the 1950s following the Supreme Court Brown v. Board of Education decision – the initiative “is designed to provide students with powerful tools for self-awareness, stress resilience and self-healing,” Bhagat said. Bhagat, who was named the 2016 Peacemaker of the Year by the Richmond Peace Education Center (RPEC), told WCVE last fall that it will “require a massive effort … to counteract the effects of trauma and racially and economically segregated schools,” he said. Drumming is frequently integral to Bhagat’s approach. 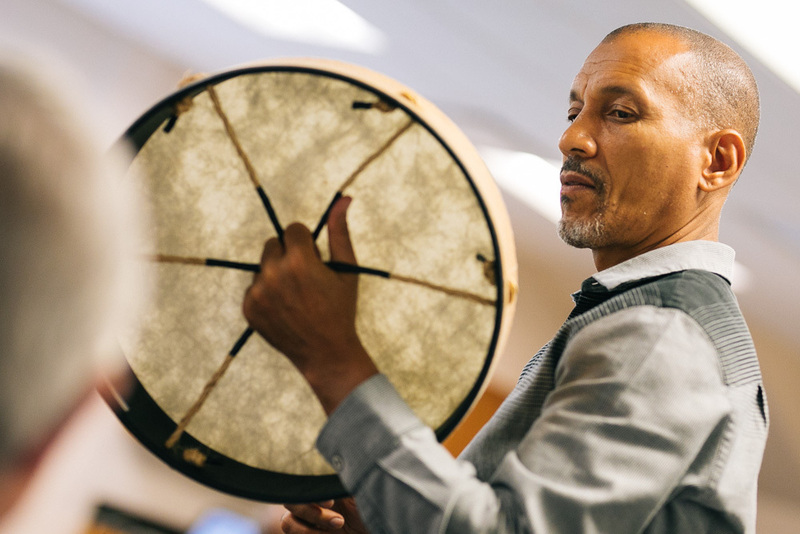 In the early 1990s he co-founded Drums No Guns, which uses rhythm to build healing community. An international conflict resolution trainer for RPEC, Bhagat has also provided vision and leadership to programs such as the Richmond Youth Peace Project, The Conciliation Project, Emotional Emancipation Circles, Healing and Rebuilding our Communities, and others. Offer resilience is quite Christ-like: turning the other cheek, rather than striking. In that turning, one is offered a different perspective or point of view, discovering unique opportunities. Resilience implies elasticity and openness to new configurations of thought and behaviors. I imagine the give and take of a rubber band between two hands stretching beyond its apparent origin and limitations. Likewise, a rubber ball has the potential to bounce back after being pushed or hit against harder elements. Dr. Rahm Bhaghat , like all good doctors, practices good medicine. He is the quintessential dude whose actions speak louder than words, whose drumming reverberates in our souls, hands, feet, and communities. Dr. B is always making a change. We love him here in Richmond because he is always about healing and true justice. He should get the Nobel Peace Prize because his whole life has been dedicated to peace. I’m a high school teacher in South Africa. We have major trauma and in need of major healing. I wonder if Dr B would be interested in sharing his healing work over here?